This video provides with a step by step breakdown of the mechanism and helps you understand WHY this reaction undergoes anti addition and still follows Markovnikov’s rule. This is Video 4 in the Alkene Reaction Mechanisms Video Series. Click HERE for the entire series. Ready to test your skills? 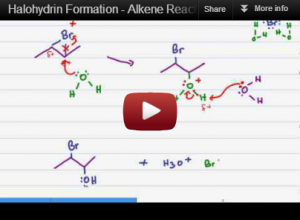 Try the Alkene Reactions Practice Quiz after watching the series! So helpful! This type of step-by-step explanation is much appreciated. You make Organic chemistry so simple, thank you so much. so would this be considered anti addition since they add on opposite sides of the double bond and steriochemistry antimarkovnikov since the cl ended up on the less substituted carbon? Shama, did you check my complete alkene reaction series?